Increasingly, as the production, distribution and audience of films cross national boundaries, film scholars have begun to think in terms of ‘transnational’ rather than national cinema. This book is positioned within the emerging field of transnational cinema, and offers a groundbreaking study of the relationship between transnational cinema and ideology. The book focuses in particular on the complex ways in which religion, identity and cultural myths interact in specific cinematic representations of ideology. 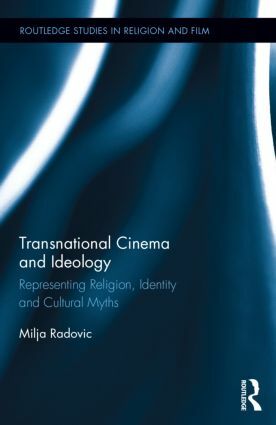 Author Milja Radovic approaches the selected films as national, regional products, and then moves on to comparative analysis and discussion of their transnational aspects. This book also addresses the question of whether transnationalism reinforces the nation or not; one of the possible answers to this question may be given through the exploration of the cinema of national states and its transnational aspects. Radovic illustrates the ways in which these issues, represented and framed by films, are transmitted beyond their nation-state borders and local ideologies in which they originated – and questions whether therefore one can have an understanding of transnational cinema as a platform for political dialogue. Milja Radovic is a Post-Doctoral Researcher at the University of Edinburgh, where she is collaborating on the Religion and Ethics in Making of War and Peace Project, investigating the role of the independent media in shaping of civil society in the Balkans.